The South Florida and Treasure Coast Regional Planning Councils are actively involved in activities to further the study and protection of the Florida Reef Tract. 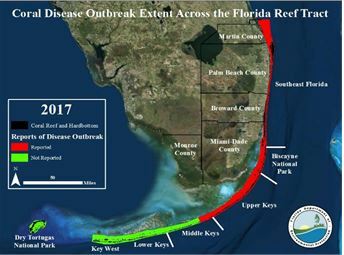 Over the last four years Florida has been struggling to diagnose and treat a cataclysmic nearshore coral reef disease outbreak affecting the Florida Reef Tract between Martin and Monroe counties. It is spreading rapidly and unfortunately, in April, was found in the nearshore reefs in the lower Florida Keys. This issue is of such great importance that in January the Councils convened a shared staff working group to identify and implement action steps to raise awareness and find resources to protect and save this important state and national treasure. This initial working group includes Councilmembers and staff from both regional planning councils, the region’s counties, the Florida Department of Environmental Protection and The Nature Conservancy. Over the last few months notable successes include passage by State Senator Lauren Book and State Representative Kristin Jacobs of Senate Bill 232 and House Bill 53 establishing the Southeast Florida Coral Reef Ecosystem Conservation Area as well as continued funding by Congress of the South Florida Geographic Initiative. Full funding of the South Florida Geographic Initiative is a critical part of ensuring that additional science, data, technical assistance, and financial resources for understanding and treating the reef disease are available. Councilmembers Mayor Beam Furr (Broward County) and County Commissioner Doug Smith (Martin County) updated the Florida Fish and Wildlife Conservation Commission (FFWCC) at their April meeting in Fort Lauderdale. 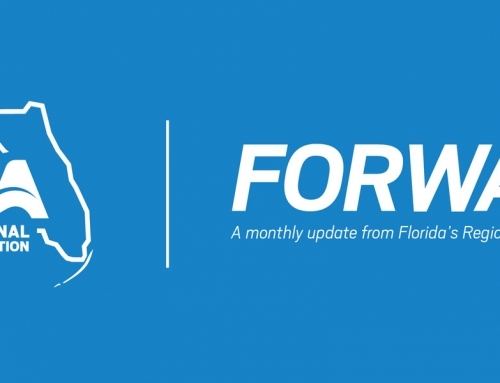 The FFWCC is working with staff to provide a more extensive update at their upcoming June meeting in Sarasota. In addition, the staff working group is organizing a special briefing for the region’s Chambers of Commerce leaders and Tourist Development Organizations on the disease outbreak and response efforts by local, state, and federal agencies. The Councils will be requesting their assistance with coordinated messaging and marketing efforts, and engaging these business leaders in advocacy for the Florida Reef Tract. If you are interested in learning more about this initiative, please contact Isabel Cosio Carballo (isabelc@sfrpc.com) and Michael J. Busha (mbusha@tcrpc.org). This year marks the 26th Annual Future of the Region Awards hosted by the Tampa Bay Regional Planning Council. 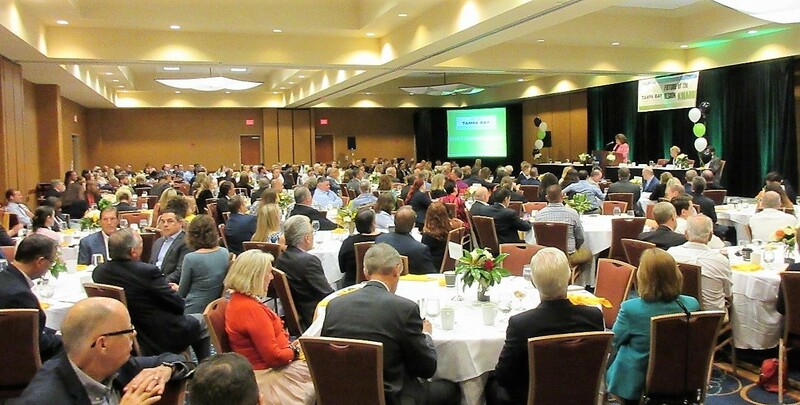 Over 300 people attended to honor and recognize notable achievements in innovative regional planning. The Future of the Region Awards event highlights projects and programs that exemplify regionalism and recognizes outstanding achievements and contributions that benefit the regional community. The Council’s mission in recognizing excellence is to encourage future vision and collaboration among our communities and local governments. Held on Friday, May 18th, 2018 at the Hilton Carillon Park Hotel in St. Petersburg, this year’s event was the largest to date and featured a video from Senator Bill Nelson’s office. The event has grown to include six corporate sponsors and 55 competitive entries from both government agencies and the private businesses. 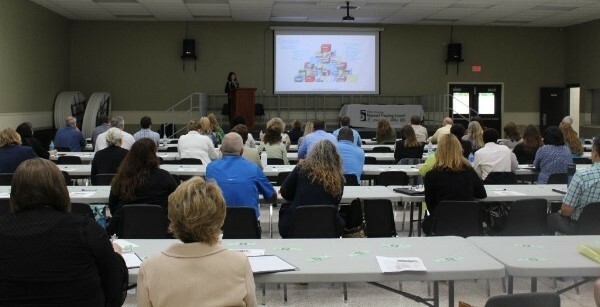 * Cori Henderson, Director of Business Development for Enterprise Florida, Inc. 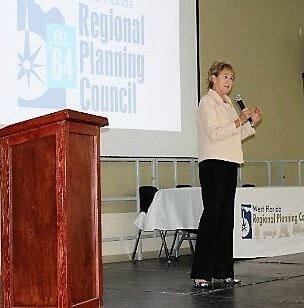 Guest emcee for the event was Freeport City Councilwoman and West Florida RPC Chairperson, Kasey Cuchens.